Parliament will be making a key decision on whether to replace the Trident nuclear weapons system in 2016, so this is a key time to show that ordinary people want to see it scrapped, Costing over £100 billion across 40 years, this will be the biggest spending decision this parliament makes: so it’s important they hear people’s voices. 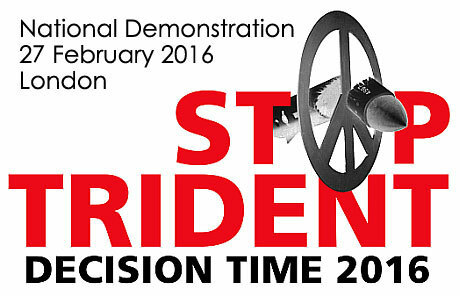 Campaign for Nuclear Disarmament (CND), alongside others, have organised a march in London on Saturday 27th February 2016, calling for Trident to be scrapped. Our friends at West Midlands CND are organising a coach to the Stop Trident march, with pick-up points in Birmingham City Centre, Moseley, Kings Heath, and Warwick. Download the booking form and return to wmcndall@gmail.com – you can also pay your donation to the coach (£15 standard, £10 concessions) online on the WMCND site. More details of pick-up points and times from WMCND, or contact: wmcndall@gmail.com or 07804 874 115. Tell the government: let’s spend £100 billion on health, housing and renewables – not nuclear weapons. And if you’d like to make your voice heard a little closer to home, pop into Peace Hub to find out more, and take action.